This print is one of a series portraying female "types," in this case a fickle, flirtatious woman identified by her wandering eyes and disregard for her exposed breast. 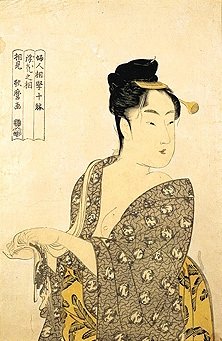 "Big-head pictures" (okubi-e) of courtesans in brothels or teahouses were mass-produced beginning in the seventeenth century in an affordable medium for a large urban population. Among the first images to reach the West, these eroticized portraits provided a potent foundation for Western stereotypes of Japanese women.